In the words Max Goldman; "We're having a heat wave, a tropical heat wave!" For those of you that haven't seen the movie Grumpy Old Men, this is one of my favorite lines of the entire movie, and I highly recommend watching it. Only a true Northerner would call a 20 degree day in Minnesota a tropical heat wave. However, we've been experiencing 50-60 degree days over the past week in southwest Minnesota and it definitely feels like a tropical heatwave. Break out the shorts and tank tops! Replacing closing wheel bearings on the drill is a never ending task. It's a great drill but a really bad closing wheel design. 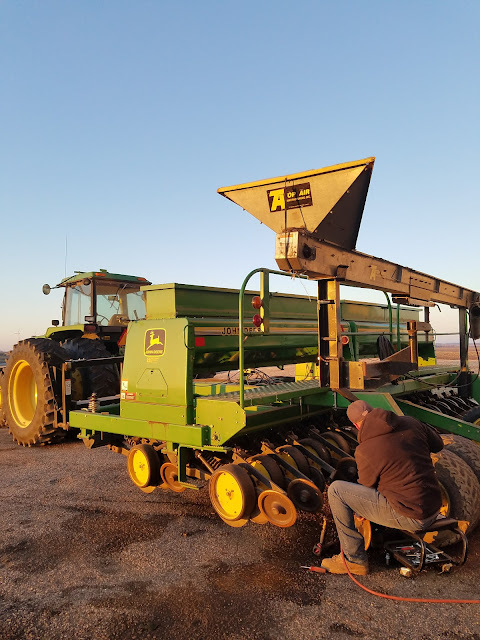 For someone without an enormous shop equipped with heated floors and ample space to accommodate even the largest machinery, its a blessing to have warm weather to prep equipment outside for spring planting. The yearly scramble to get planting equipment ready to go right before it's time to hit the field is my absolute least favorite time of year. It never fails that something, however small or seemingly insignificant, will bring planting operations to a screeching halt if spring prep and maintenance are done hastily. It's at those moments, when patience and time are in short supply, that I would give almost anything to have a place to get everything field ready for spring. With the possibility of another high stress spring around the corner (still haven't built that fancy shop) we're taking full advantage of the spectacular February weather to do routine maintenance and repairs, outside. Who wouldn't want to be outside when it's 60 degrees in February anyhow? The list of things that need to be done before planting starts is always long and can be extremely time consuming. One of my main goals over the winter has been to make sure our drill is ready to go as soon as it is fit to start seeding small grain. There are always closing wheel bearings to replace on a John Deere 750 drill but it's a rather simple task. We're also adding an in-furrow liquid fertilizer setup and replacing the after-market bean meters with the factory seed cups. The factory units meter cover crop mixes and small grain seed better than bean meters. Whether it's fixing equipment or just soaking up the sun; it would seem crazy not to be outside when the weather is this nice in February. The warm weather has allowed us to finish some important equipment prep before the spring rush hits and it feels great to cross a few things off the spring to-do list. If you have something you've been putting off during the winter now is a great time to get it wrapped up so there is one less thing to worry about come spring. Make Max Goldman proud and take advantage of this tropical heat wave in February. Thanks for reading. We focus on the soil. We believe that building a robust and resilient soil will provide us with better and more consistent yields in normal, dry, or wet years. Our aim is to build soil with superior aggregate stability, microbial activity, and high organic matter content with great water holding capacity and infiltration rates. We regard these ideals as the cornerstones of a responsible, sustainable, and profitable farming practice.